Installed the latest update and have been troubleshooting it instead of sleeping. the bottom of their pages. 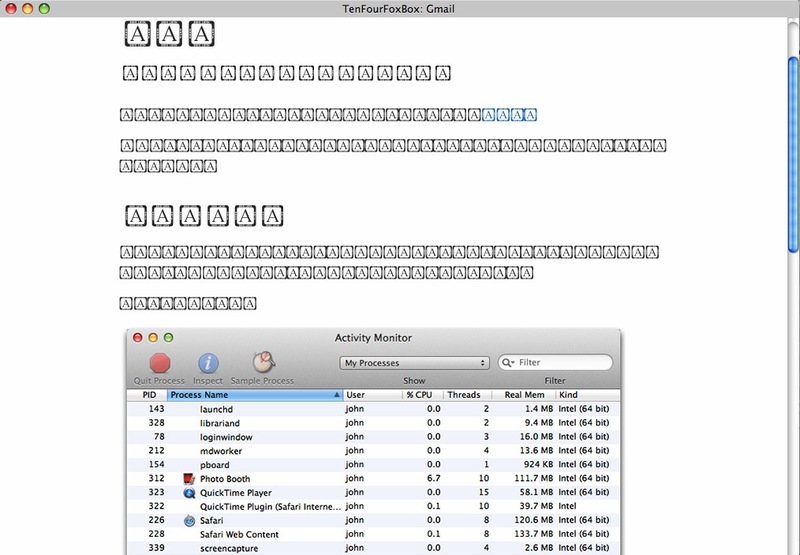 An letter "A" in the black title bar, by each function. Hadn't tried other pages or other sites. I'm hoping to go back to earlier 10fourFox. not restored. So that's another bug. I don't have time for this, nearly 2AM here. also lets you get out of full-screen -- not in browser toolbar) after update. I'm sorry to have updated this; but the prompt appeared to do so & I did. Thank you for your time & consideration in this matter. 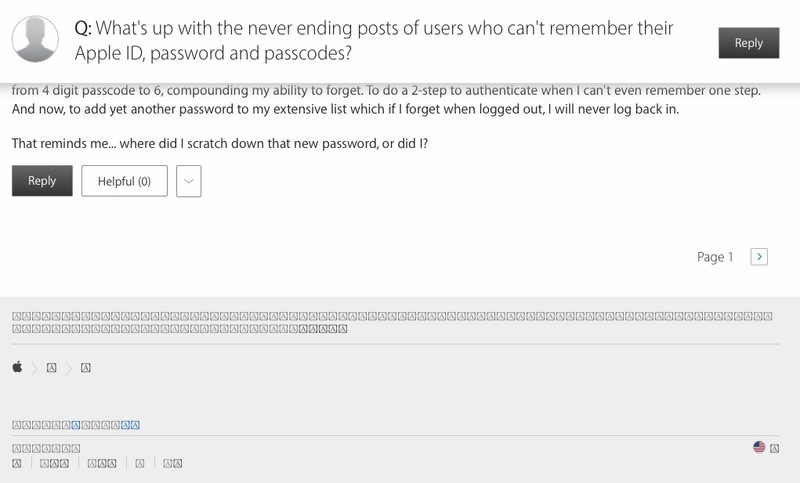 I'm not able exactly to understand what you are referring to with your bookmarks or the full screen question. Please be more detailed. those missing Text items with the latest TenFourFox 45.7.0 build. At least with my G4 Mini 1.5GHz running Leopard 10.5.8. 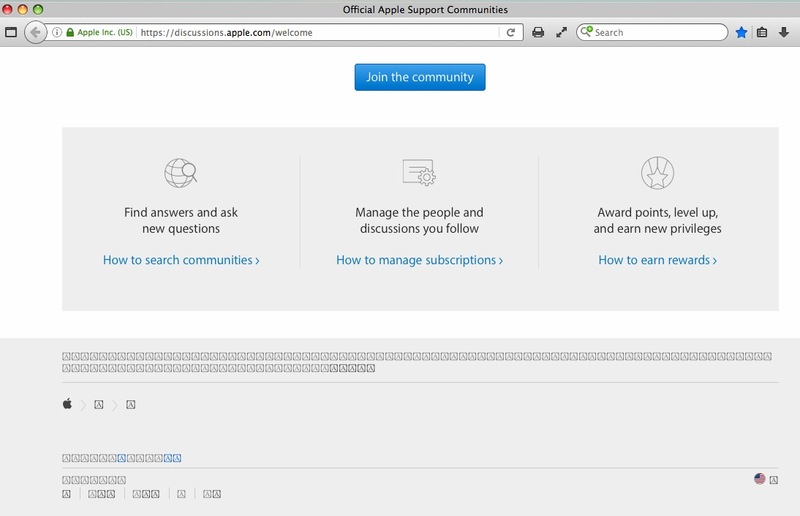 About the only page at Apple which does not fail to render, is developer. Wonder why that one works? Even the tiny print with links at bottom, OK.
versions don't render this font so unreadably terrible as boxed Latin A's. 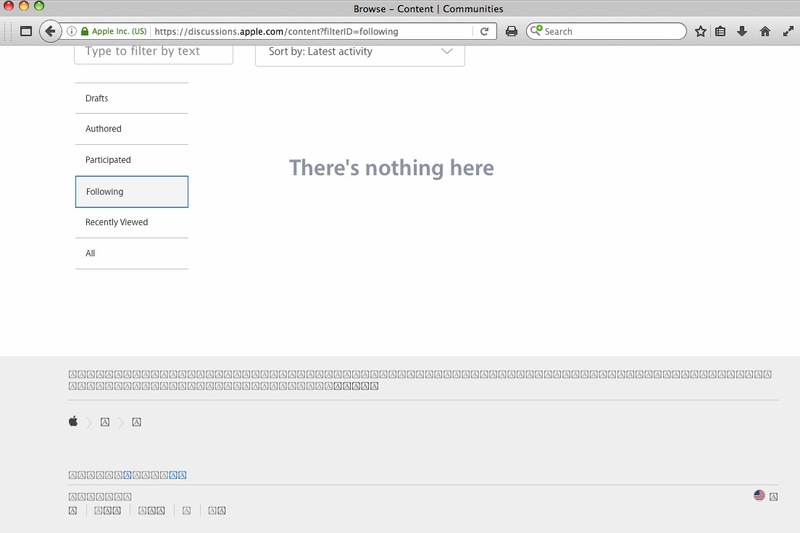 The problem isn't the browser, it's a bug in Apple Type Services (i.e., the OS). Every other version of TenFourFox will render it the same way because it's actually ATSUI doing the font management. The fix is to tell ATSUI not to try and to fall back on a different font, which is what Safari 5 and Leopard Webkit do automatically, but we need a manual blacklist to maintain 10.4 compatibility. Apple.com' still works, and presents correct readable text. "minor change to its website on Tuesday integrated its in-house developed San Francisco typeface"
those Apple.com pages that do load to fail. Unless Apple implements a fix. the black icon A. Slow internet connections allow correct text to be seen, first. faith alone, thought the official site had not changed. in about:config to be able to read help pages. is satisfactory until such time as later TenFourFox offers correction. articles, their text can be copied/pasted &/or screenshots are legible. TFF 45.8.0 is still affected by this font problem. While Apple's pages show ok now, even with standard settings, there are still other bad ones. Just like on TFF 45.7 this one can only be read using "gfx.downloadable_fonts.enabled = false". Mike, if you know more sites that are affected, please list them here also. The fundamental problem, as you commented correctly, still exists and can, as far as I understand, not be solved easily (or at all). So, all that can be done for now is to add the affected sites or fonts to a blacklist that will be updated in the next version of TenFourFox following the report. BTW if you just need to read the text and don't care for formatting, you can simply click View>Page Style>No Style on such sites. Chris, there are currently no other problematic sites that I know of. If I'll come across any, I'll report for the list. Chris, I haven't seen an other "nasties" yet. This mail is mainly to show that my email adress is working. > TenFourFox following the report. > you can simply click View>Page Style>No Style on such sites. arrows that one clicks on to activate features, etc. washington post uses this, adn.com does, among others. change in the default similar to gfx.downloadable_fonts. as noted in about:config browser settings. advantage of any other fixes as they present themselves. of the problems are due to Apple's changed default fonts. Sites to the degree I've noticed, they'd be unable to read/post. able to access an increasingly changed (not necessarily better) web. remove the older or less complete one. I'd tried adding attachments. I'll add these to the list for 45.9. Eventually we'll need a better way of blacklisting these, maybe with a live listing instead of having to precompile them into the browser. function, disclosure triange or other mechanism that don't show correctly. Monitor (in 10.5.8) w/ single processor 1.5GHz G4 Mac Mini. Seems excessive.